I love scarves and basically live in them from early fall till late spring. As a result, I always feel a little incomplete style-wise when summer rolls in and it's too hot for a scarf. I have lightweight scarves that work on those unseasonably cooler summer days, but for the rest of the time, I'm loath to wrap anything around my neck. As Ella says, "It's too darn hot." I've tried statement necklaces as a scarf alternative in summertime, but even those seem too burdensome when it's 90 degrees Fahrenheit. What's an over 50 gal supposed to do? This summer, I pulled out a string of faux pink pearls (above and below) from my bobble box. I can't begin to tell you how old the necklace is--several decades at least. For the most part, these pearls have been collecting dust for years. Now, though, I'm wearing them a lot. They aren't suffocating like a scarf and they aren't heavy like some statement necklaces. I am fortunate enough to have a couple of inherited short strands of real pearls, but I like a longer strand much more right now. Since turning 50, I'm a little uncomfortable in anything that is supper conservative or demure, like sweater sets, boxy suits and short strands of pearls. Unlike a short, pert strand of pearls, a long string of pearls falls carelessly from the neck. And as Coco Chanel (below) has shown us, gobs of long, looping strands of pearls add drama to any outfit. It's something to aspire to! Long strands of real and faux pearls are available online to fit every budget, from $15 to well over $1,000. Below are just a few things I found. I also saw some listings on eBay. And, of course, you'll find an elegant Chanel pearl necklace online--without a price tag. I can just imagine! If you're looking for a really inexpensive faux pearls, be careful. They don't always look great, especially the clasps. My long strand of faux pearls doesn't have a clasp, so it's a non-issue. Psst! If you like any of the choices below, click on the photos to see the current prices. Semi-annual sales are still going on at many sites. Anne Klein Strand Necklace ($40). This necklace is 60" long. 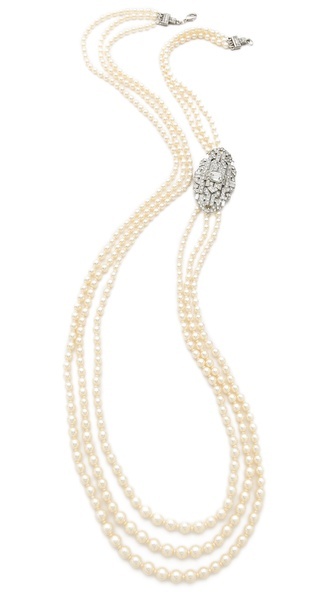 Nordstrom 6mm Glass Pearl Extra Long Strand Necklace ($48). Length = 72 inches. Lauren Ralph Lauren Long Glass Pearl Necklace ($58). Length = 60 inches. Givenchy Glass Pearl Rope Necklace White Pearl/ Silver ($75). Length = $52. What do you wear around your neck in the summer?